If you are looking for industrial roofing contractors Newcastle look no further. Here at John Dobbs Roofing we have many years of experience in providing high quality roofing services. We can provide a whole range of solutions tailored to your commercial building needs, with free design on any roofing work we undertake. Whatever the reason you require specialist help, choosing the right roofing contractor who can complete all elements of roofing services and design and advise you along the way is essential. At John Dobbs Roofing we can provide all the roofing services you may need, backed up by our expert advice tailored to provide the best job for your commercial units. Wear and tear over time can mean the need for minor roof repair work in Newcastle. Increasingly volatile weather can also bring storm damage. Whatever the reason for any damage to a roof it is essential for the protection of the building's inventory that it is quickly and efficiently repaired. We completely understand the potential threat to a business of a damaged roof and will work with you to provide the roof repairs Newcastle which your business needs promptly done. Single skin roof sheeting is a cost effective method suitable for warehouses and storage units. One of the most common roofing types it is quick to install and can help with the aesthetics of a building. Suitable for refurbishments and as a replacement for a damaged roof, single skin sheet roofing is strong, lightweight and a practical solution. The twin skin roof sheet option consists of two layers of profiled sheets which have a metal spacer grid separating them. An insulation quilt fills the void between the sheets. This method combines an appealing aesthetic look with the modern day functionality demanded of roofing insulation. Used in a wide range of commercial buildings they can be quickly installed to weatherproof a building and improve its energy efficiency. Versatile and suitable for most commercial roofing solutions, single ply membrane is another method John Dobbs Roofing can provide as roofing contractors Newcastle. This has increased in popularity as a choice for flat pitched roofs due in main to its durability, They consist of flexible sheets of a synthetic polymer such as PVC which are easy to install and repair. Other benefits are their resistance to chemicals and resistance to damaging UV light. Insulated panels offer a single component installation allowing for a faster on-site job. An easy to fit, low maintenance option they offer a superior thermal performance. A properly insulated roof is a more energy efficient building, meaning lower utility costs overall and an improved carbon footprint for your company. A green or a living roof is a great way to have a roof which is pleasing to look at, effective and good for the local environment. Designed to benefit the local ecology under pressure from loss of habitat, particularity in built-up urban areas, this type of roof adds a green space amid surrounding concrete. They help sustain local indigenous plants which in turn benefits insects and birds. A living roof also helps contribute to improving air quality as well as reducing the flow of rainwater, especially useful in times of storms when short, sharp bursts of heavy rain can be so disruptive. A green roof installation is also a very effective insulator, helping you control utility bills and also proving an effective soundproofing system for your commercial units too. These are a sample of the roofing services John Dobbs Roofing can provide. As industrial roofing contractors in Newcastle we have the experience and expertise to advise, design and install a roof system that meets your business needs and all the requirements of modern standards and regulations. Whether it is a new build roof, refurbishing an existing roof to extend its life span, or carrying out repairs, we have the know how to help you get the best results. Protection of your commercial property and inventory within is vital to the success of your business and we are confident we can deliver you the highest quality roofing services. Over time consideration will need to be given to refurbishment of a roof to ensure the building's inventory is not placed at unnecessary risk with all the potential financial implications that implies. Whether it is adding insulation, sealing a flat roof, asbestos sheet replacement or updating a roof to today's standards, John Dobbs Roofing provides the services to cover all eventualities. Refurbishment of a roof can involve the stripping and replacing of sheets to a design tailored to meet your needs. 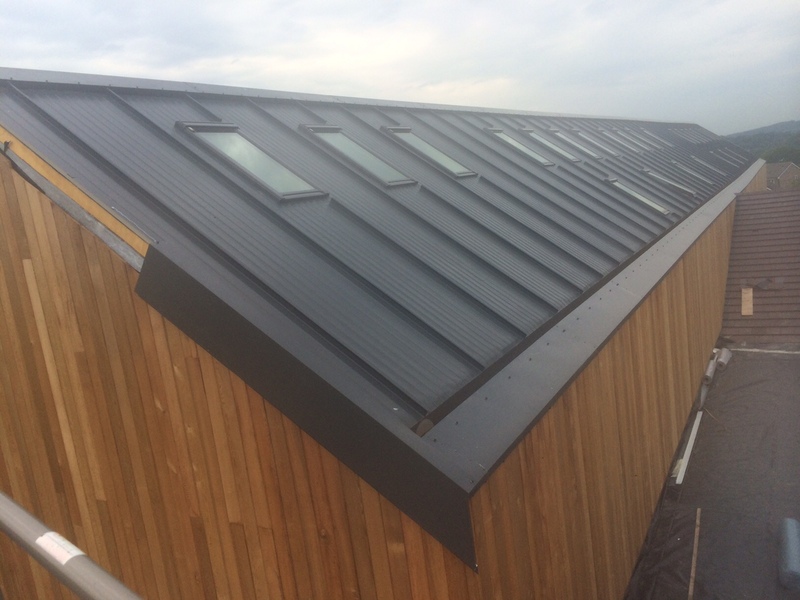 Alternatively by using the over skin method you can still get the look of a new roof by over-cladding the existing roof in the latest sheeting materials. We would work with you to advise on the best approach for your particular unit in order to suit the aim and budget for your roof. As well as being able to carry out any necessary repairs to your roof a specialist roofing contractor should have the skills and resources to complete a new roof installation. Using the latest technology they should be able to assist in the design and subsequently deliver the roof that matches the requirements of your commercial unit. By supplying the right roof design from the range we can offer we can not only secure the integrity of the building against the elements, but with good insulation help you save on future utility bills. A well designed, professionally installed roof and guttering system can pay for itself over time.